I admit, I am not as diligent about engine room checks as some folks are. I am not as diligent about engine room checks as some folks tell me I should be. For better or worse, I have been somewhat laissez-faire about this responsibility. I am not entirely free of anxiety, but my anxiety is often not sufficient to motivate me to move to the engine room from the comforts of my helm chair. Some might think of that as “risk-taking behavior.” I haven’t had any serious incidents in 10 years and 42K miles aboard, but I could be living on borrowed time. I am a technology guy. I have written about my laptop and tablet computer choices, my on-board router, my wi-fi range extender, my cellular modem choice and my AC electric energy monitor. I have written about getting real-time data from my navigation instruments to my laptop and tablet via my NMEA multiplexor. So I took a look at using a technology approach to engine room checks? Because I already have a router aboard, adding new wi-fi features and functions is easy and straight-forward. For some months now, I have though that mounting a couple of wireless Internet Protocol (IP) cameras in my engine room would reduce my risk and my anxiety. IP cameras are a known quantity. IP Cameras have been available in business and home markets in security and baby monitoring applications for some time. Why not put one or more in the engine room to monitor certain key functions, such as the engine alternator’s voltage regulator, fuel filter(s) or the output shaft and its packing gland or dripless shaft seal? Recently, I found Foscam FI8918B/FI8918W wireless IP cameras available at amazon.com <http://www.amazon.com/dp/B00466X9SY/ref=pe_385040_30332200_TE_item&gt; for a very attractive $50 price tag. I couldn’t pass that up, and I ordered two cameras. These wi-fi cameras installed easily. They produce still photos and full motion video at a resolution of 640 x 480, so very adequate for online viewing or Internet blog posting (see below). Images and videos are automatically stored for later viewing in the iOS device’ photo album. The infrared CMOS image capture technology produces acceptable detail even if the engine room lights are off (the normal condition). These cameras have built-in web servers. They are are accessed and configured via any common web browser (Firefox, Chrome, Safari, IE). Any computer, tablet or cell phone with any browser can access and configure them. The cameras can be continuously panned in every direction. They are rated for temperatures up to 140ºF, so are fine in my engine room. My version of the camera requires 5VDC; mine get that with 90-to-250VAC power “bricks.” They have a preset function that allows for automatic pan/tilt to a predefined field-of-view, such as “filter 1” or “filter 2” at a screen tap. They support sound via a built-in mic, but I haven’t played with that in my application. Built-in motion alarms are available. The cameras can be set up for remote access, via DDNS over the Internet, which would enable monitoring from offsite locations. A very nice package for $50. The cameras do have some minor limitations. These cameras are 0.3 megapixel units, so resolution is limited. The 67º field-of-view is very wide, so they must be mounted nearby to monitor small objects. There is no way with these cameras to adjust color rendition, and I have observed that reds are washed out and contrast adjustment is challenging. I also note that when the engine room lights are off, the infrared does not pick up the yellow and red warning bars on my fuel system vacuum gauges. However, I do not find any of these limitations to be serious in my application. 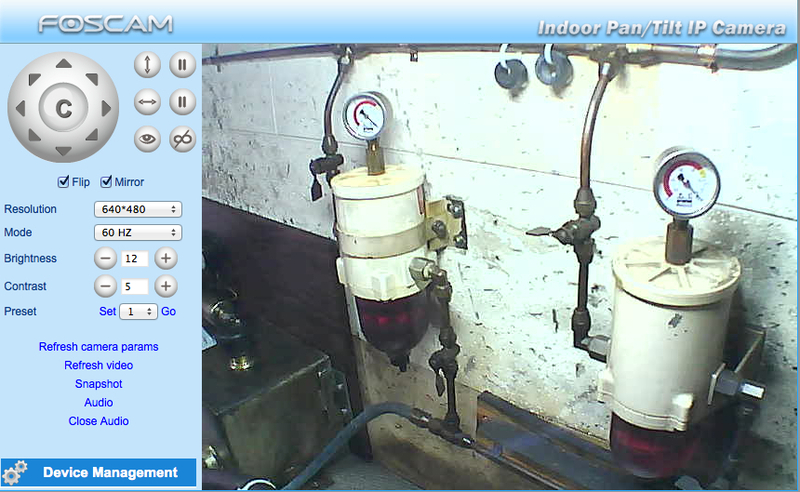 To the left is an image of my fuel manifold taken with one of my IP cameras and captured via Firefox on my Macbook Pro. This enables me to monitor my fuel vacuum gauges while underway. Interestingly, with the engine room lights off and just the infrared imaging, I can see the internal structures in the fuel bowl quite clearly. To the right is an image of my drive shaft and packing gland (transmission and shaft coupling toward the bottom, packing gland toward the top). This image was from the second IP camera, also captured via Firefox. In Apple’s iTunes store, I found a $6 iOS app called FoscamPro. The app supports both the iPhone and my iPad. The app renders several camera images at the same time. Note, this app in not developed of marketed by the camera manufacturer. Shop carefully here. There is a free app that had very poor reviews, and although it appears to be from the camera manufacturer, reviewers say the app is privately developed and the logo is pirated. I dunno. In any case, the FoscamPro app seems fine in my environment. Since I use the iPad on my flybridge, I find being able to see multiple images concurrently to be quite convenient. 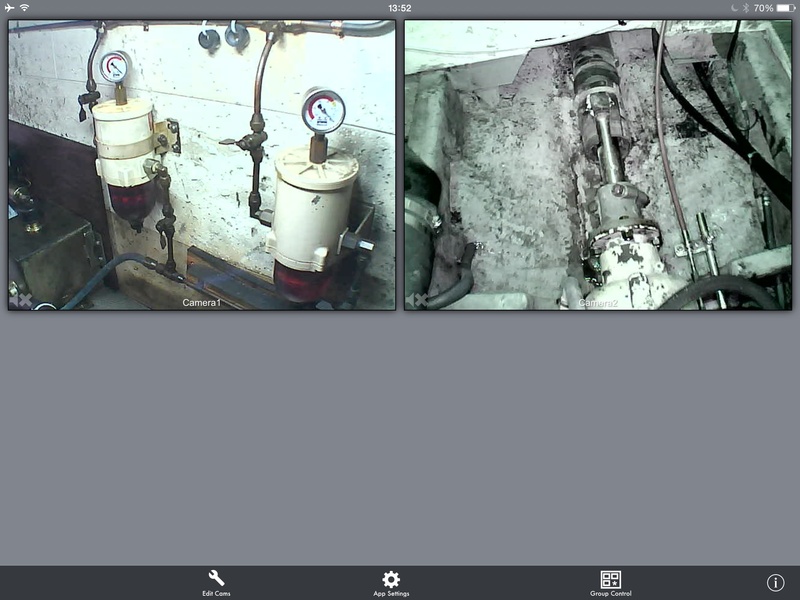 FoscamPro “home” screen showing multiple IP camera images monitoring engine room systems. 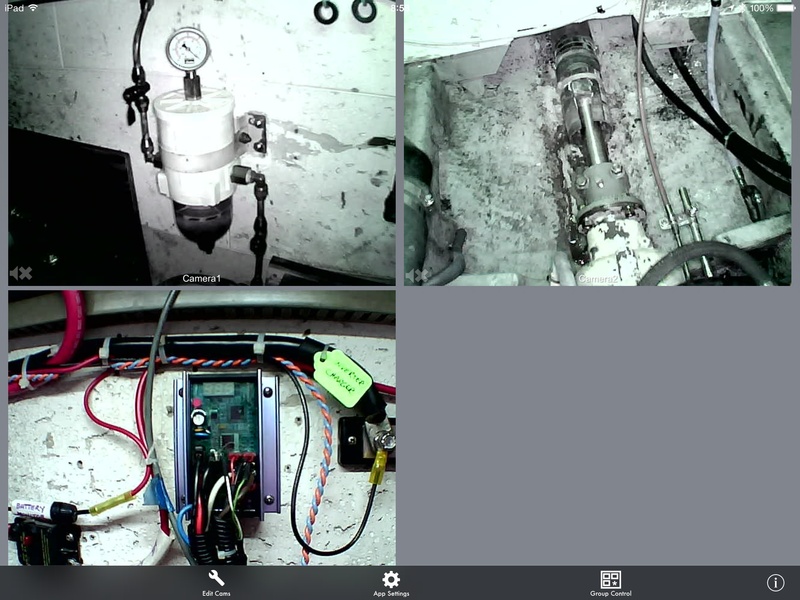 To the right is a view of the FoscamPro app portlet containing the image of my Balmar ARS-5 Voltage Regulator. Just while testing the camera installation, I observed strange regulator behavior that needs follow-up with Balmar technical support. The great benefit is that I can now track this system in realtime, while the engine is running, without close proximity to moving parts. Prior to installing the camera, the regulator’s location in the engine room made it virtually “impossible” to observe while underway. 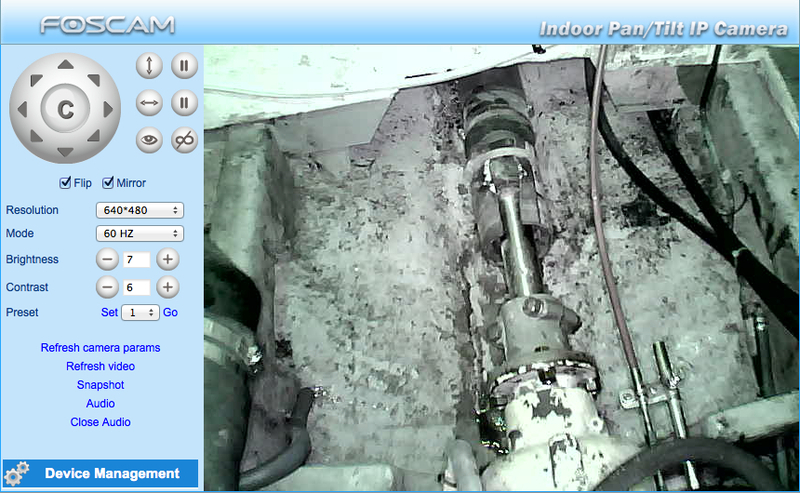 I definitely do not suggest that these wireless IP cameras are completely equivalent to an in-person engine room check. The infrared capability of the camera will highlight hot-spots, but will not measure temperatures. It cannot see everything that an in-person engine room inspection would disclose. However, for visually spot-checking key areas, this is a good solution for us aboard Sanctuary, and particularly for those who might be disinclined to move around the boat in heavy sea states. 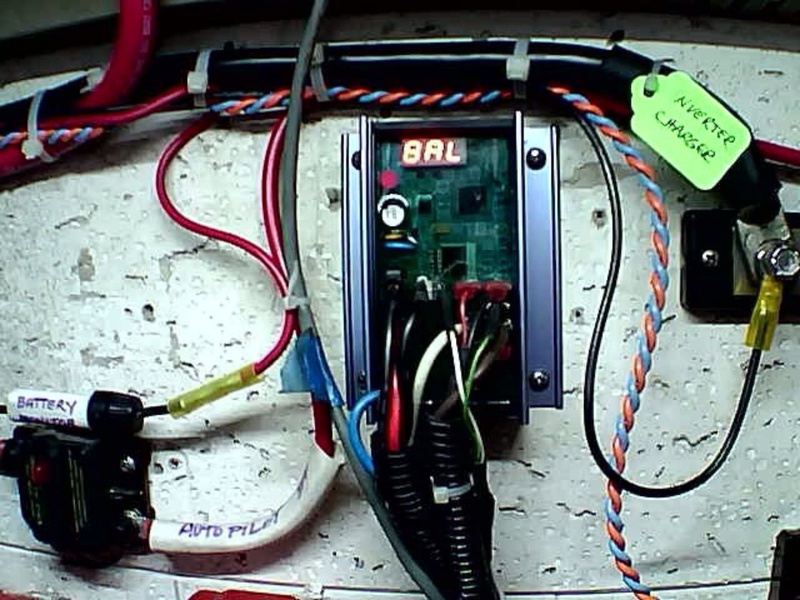 This entry was posted in Wireless IP Camera on 2014/07/23 by gilwellbear.